Background: Abdominal injuries contribute significantly to battlefield trauma morbidity and mortality. This study sought to determine the incidence, demographics, clinical features, spectrum, severity, management, and outcome of abdominal trauma during a civilian conflict. 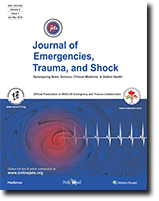 Materials and Methods: A prospective analysis of patients treated for abdominal trauma during the Jos civil crises between December 2010 and May 2012 at the Jos University Teaching Hospital. Results: A total of 109 victims of communal conflicts with abdominal injuries were managed during the study period with 89 (81.7%) males and 20 (18.3%) females representing about 12.2% of the total 897 combat related injuries. The peak age incidence was between 21 and 40 years (range: 3–71 years). The most frequently injured intra-abdominal organs were the small intestine 69 (63.3%), colon 48 (44%), and liver 41 (37.6%). Forty-four (40.4%) patients had extra-abdominal injuries involving the chest in 17 (15.6%), musculoskeletal 12 (11%), and the head in 9 (8.3%). The most prevalent weapon injuries were gunshot 76 (69.7%), explosives 12 (11%), stab injuries 11 (10.1%), and blunt abdominal trauma 10 (9.2%). The injury severity score varied from 8 to 52 (mean: 20.8) with a fatality rate of 11 (10.1%) and morbidity rate of 29 (26.6%). Presence of irreversible shock, 3 or more injured intra-abdominal organs, severe head injuries, and delayed presentation were the main factors associated with mortality. Conclusion: Abdominal trauma is major life-threatening injuries during conflicts. Substantial mortality occurred with loss of nearly one in every 10 hospitalized victims despite aggressive emergency room resuscitation. The resources expenditure, propensity for death and expediency of timing reinforce the need for early access to the wounded in a concerted trauma care systems. Background: Due to lack of training in emergency care, basic emergency care in India is still in its infancy. We designed All India Institute of Medical Sciences basic emergency care course (AIIMS BECC) to address the issue. Aim: To improve the knowledge and skill of healthcare workers and laypersons in basic emergency care and to identify impact of the course. Materials and Methods: Prospective study conducted over a period of 4 years. The target groups were medical and nonmedical personnel. Provider AIIMS BECC is of 1 day duration including lectures on cardio-pulmonary resuscitation, choking, and special scenarios. Course was disseminated via lectures, audio-visual aids, and mannequin training. For analysis, the participants were categorized on the basis of their education and profession. A pre- and a post-course evaluation were done and individual scores were given out of 20 and compared among all the groups and P value was calculated. Results: A total of 1283 subjects were trained. 99.81% became providers and 2.0% were trained as instructors. There was a significant improvement in knowledge among all the participants irrespective of their education level including medicos/nonmedicos. However, participants who had higher education (graduates and postgraduates) and/or belonged to medical field had better knowledge gain as compared to those who had low level of education (≤12th standard) and were nonmedicos. Conclusion: BECC is an excellent community initiative to improve knowledge and skill of healthcare and laypersons in providing basic emergency care. Introduction: Cross-border firing are increasingly being common in the modern era. The injuries resulting from these low intensity conflicts are a source of anxiety among treating physicians and their respective governments. The provisions are required to minimise the suffering of the victims viz. Mode of injuries, mortality patterns, adequacy of treatment at pre-hospital and tertiary care hospital and provisions to decrease morbidity and mortality for the people living in these areas. 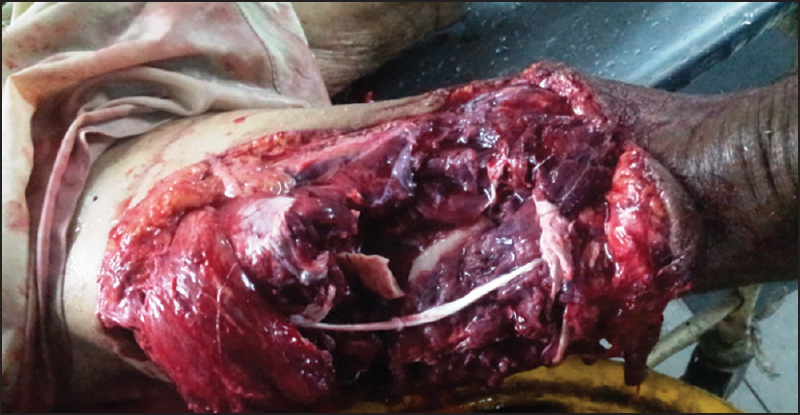 Materials and Methods: A retrospective study was conducted in GMCH, Jammu who suffered injuries due to cross border firing in the month of October, 2014. 68 patients were reported in the causality wing. All the patients were referred from level 2 trauma centre. There were 51 males and 17 females out of which 5 were children. The cause of injury, involvement of organ system, cause of mortality and morbidity and loopholes in prehospital management were identified. Results: Sharpnel were the most common cause of injury followed by indirect trauma. The common cause of mortality was abdominal and thoracic injuries. There were 4 deaths at hospital 2 of which were brought dead and 2 died during the course of treatment. There were twenty patients with extremity injuries, fourteen with chest trauma, eleven with abdomen including parineal injuries, three with head injuries, eight with ENT injuries, three with eye injuries and nine with splinters in the back out of which two were in the spinal canal. Conclusion: Prehospital stabilisation, early transport, in-transit resuscitation, immediate surgery if required and implementation of triage model and ATLS protocol has been the key to reduce mortality and morbidity. Objectives: Early diagnosis and emergent surgical debridement of necrotizing soft tissue infections (NSTIs) remains the cornerstone of care. We aimed to study the effect of early surgery on patients' outcomes and, in particular, on hospital length of stay (LOS) and Intensive Care Unit (ICU) LOS. 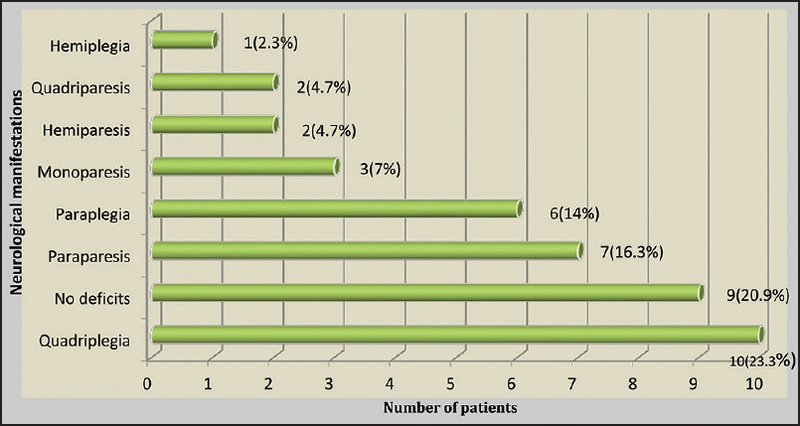 Materials and Methods: Over a 6-year period (January 2003 through December 2008), we analyzed the records of patients with NSTIs. We divided patients into two groups based on the time of surgery (i.e., the interval from being diagnosed and surgical intervention): Early (<6 h) and late (≥6 h) intervention groups. For these two groups, we compared baseline demographic characteristics, symptoms, and outcomes. For our statistical analysis, we used the Student's t-test and Pearson Chi-square (χ2) test. To evaluate the clinical predictors of early diagnosis of NSTIs, we performed multivariate logistic regression analysis. Results: In the study population (n = 87; 62% males and 38% females), age, gender, wound locations, and comorbidities were comparable in the two groups. Except for higher proportion of crepitus, the clinical presentations showed no significant differences between the two groups. 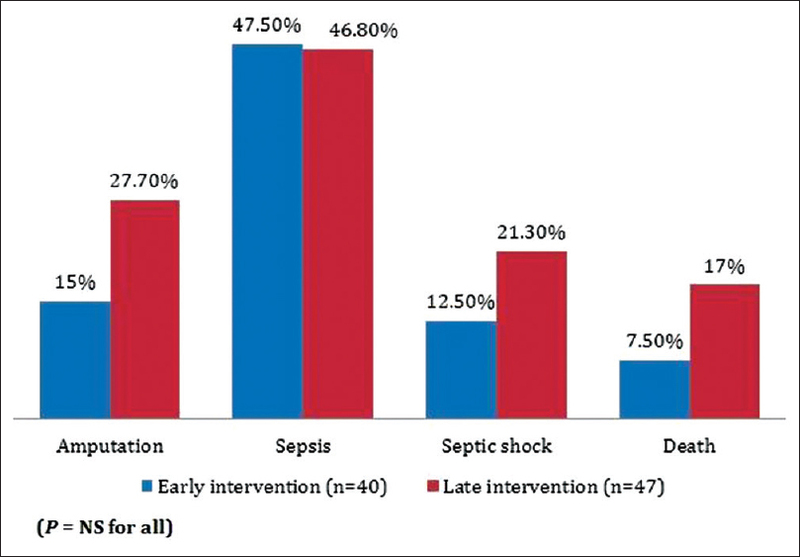 There were significantly shorter hospital LOS and ICU LOS in the early than late intervention group. The overall mortality rate in our study patients with NSTIs was 12.5%, but early intervention group had a mortality of 7.5%, but this did not reach statistical significance. Conclusions: Our findings show that early surgery, within the first 6 h after being diagnosed, improves in-hospital outcomes in patients with NSTIs. Objective: Social media allows user-generated content and dialog between users and has also entered into the domain of healthcare. The purpose of this study was to compare the use of Twitter at the Australasian College of Emergency Medicine Annual Scientific Meeting (ACEM ASM) from 2011 to 2014 and analyze its ability to spread emergency medicine education. Materials and Methods: Retrospectively, TweetReach was utilized to analyze relevant tweets. Each Annual Scientific Meeting (ASM) had an associated Twitter account/s from, which data were collected. Duplicate tweets were excluded from the analysis. Information on the number of total tweets (regular tweets, retweets, and replies) and contributors was gathered. The potential audience, the reach, was calculated. Results: From 2011 to 2014 the number of tweets rose from 460 to 4694, a 920% increase. Only 54 Twitter users contributed to the 2011 ASM. This rose to 252 (2012), 291 (2013) and 572 (2014). The average number of tweets per contributor ranged from 8.2 to 10.9. The reach, the potential number of Twitter users exposed to posts, rose >30 times from 2011 (15,502 users) to 2014 (471,166). Conclusion: The use of Twitter at the ACEM ASM rose significantly from 2011 to 2014. 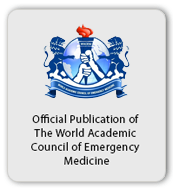 It is a highly useful tool for the dissemination of emergency medicine education. Twitter has been harnessed by the ASM to enhance the conference experience by further generating interaction between delegates as well as those worldwide. Trauma laparotomy after blunt abdominal trauma is conventionally indicated for patients with features of hemodynamic instability and peritonitis to achieve control of hemorrhage and control of spillage. In addition, surgery is clearly indicated for the repair of posttraumatic diaphragmatic injury with herniation. Some other indications for laparotomy have been presented and discussed. 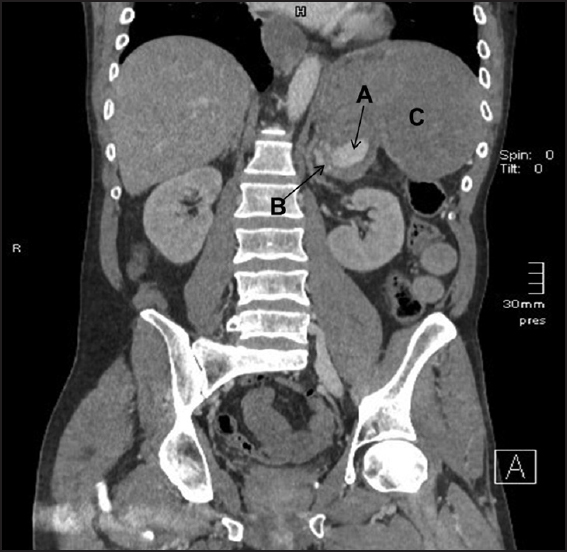 Five patients with blunt abdominal injury who underwent laparotomy for nonroutine indications have been presented. 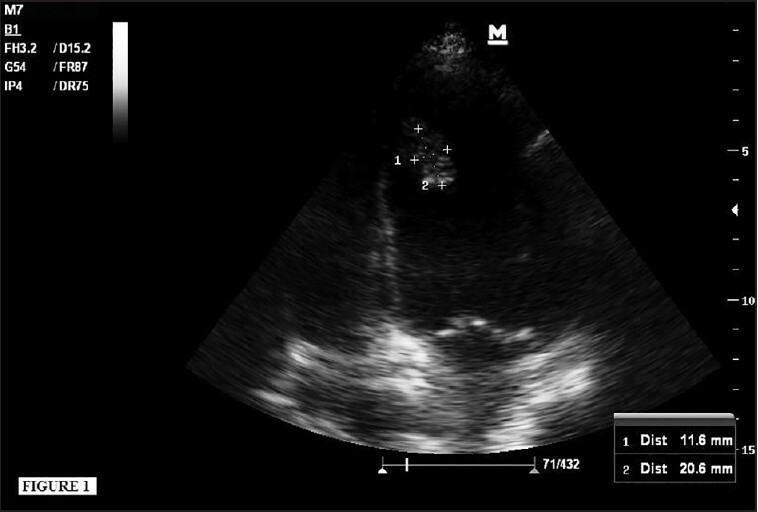 These patients were hemodynamically stable and had no overt signs of peritonitis. 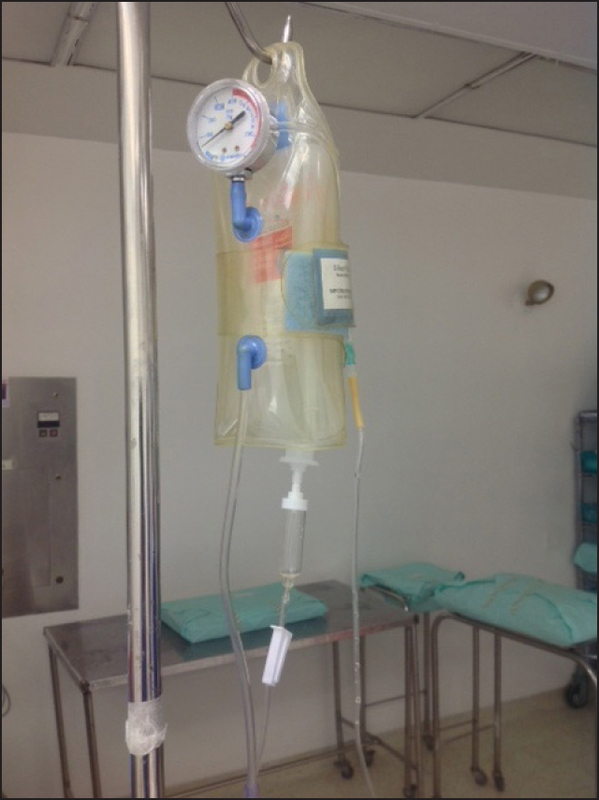 Three patients had solid organ (spleen, kidney) infarction due to posttraumatic occlusion of the blood supply. 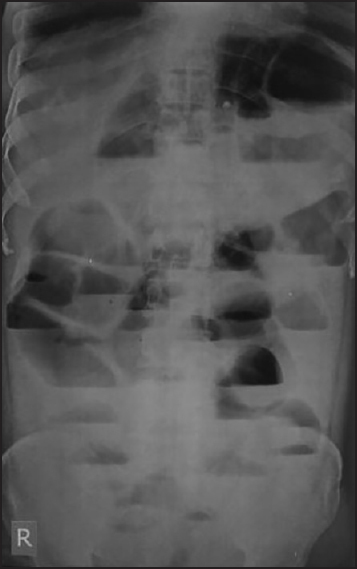 One patient had mesenteric tear with internal herniation of bowel loops causing intestinal obstruction. 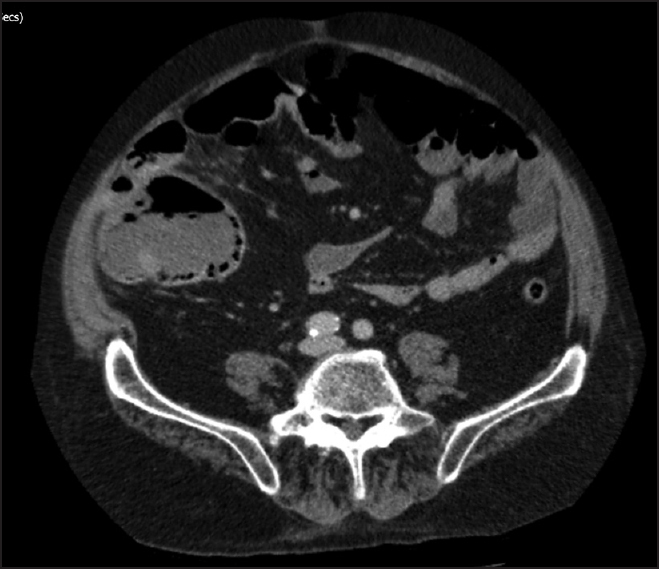 One patient underwent surgery for traumatic abdominal wall hernia. In addition to standard indications for surgery in blunt abdominal trauma, laparotomy may be needed for vascular thrombosis of end arteries supplying solid organs, internal or external herniation through a mesenteric tear or anterior abdominal wall musculature, respectively.